I don't know what it is about that late fall/early winter weather -- whether it's watching big games on TV or snacking around a bonfire -- but it makes me want dips. Hummus, ranch, queso, black bean (simply delicious recipe coming soon), guacamole...the more, the merrier! As much as I loooove plain old tortilla chips, they don't always hit the spot. The folks over at Mediterranean Snacks were at the 2012 Celiac Awareness Tour at Xavier University in Cincinnati and graciously sent me one bag of each flavor to sample. 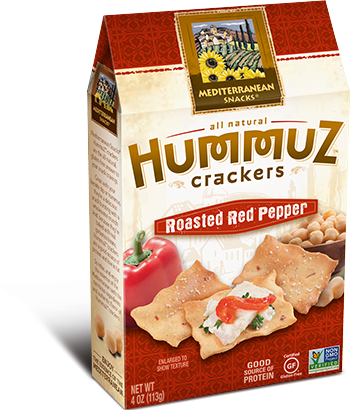 Unfortunately I took one of the bags (roasted red pepper) to a get-together, and the whole bag was tossed into a bowl with unfriendly, gluten-filled crackers. I didn't get to try a single one, but I didn't want to write my review until I had. I didn't know it would take quite so long to locate them, but I finally have!! 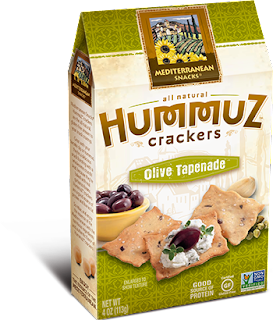 They're all tasty and light, but the olive tapenade flavor is my tastebuds' favorite. 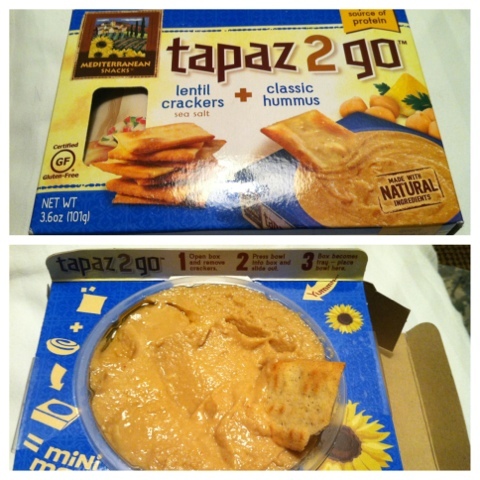 A bonus: they have since come out with Tapaz 2 Go, a portable mini-meal of hummus and sea salt lentil crackers. The packaging is really cool & simple: the box flips over & turns into the perfect plate for the hummus! So who is Mediterranean Snacks? They've been around since 2005, and their philosophy is based around Living Snactive -- combining a healthy attitude with an active lifestyle and nutritious snacks. Many of their products are legume-based and have been certified gluten-free by the Gluten-Free Certification Organization (GFCO). If you have other dietary restrictions, there are more details here, and many of the products are GMO-free. 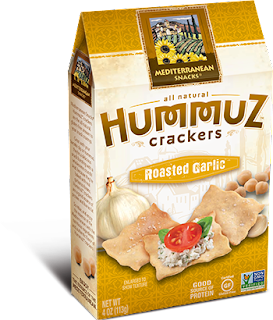 The HummuZ Crackers were sent to me free-of-charge (longer ago than I'd like to admit) from Mediterranean Snacks in exchange for an honest review. At the time, they were called HummuZ Crispz. Beyond those samples, I was in no way compensated. The opinions expressed above are mine & mine alone. 2013 ccsg cookie exchange details!